Haiku is a very old form of Japanese poetry which traditionally has 17 syllables and makes reference to nature and the seasons. 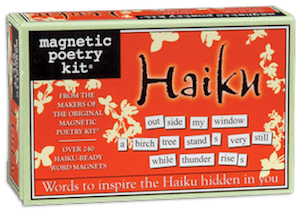 This kit will help you follow in the footsteps of the great Haiku masters. Includes words such as birch, tree, thunder, rise, shell, shore and window. Kit contains over 200 themed magnetic word tiles. Tile height is .375" and package size is 4.75w x 3 x 1.25"d.